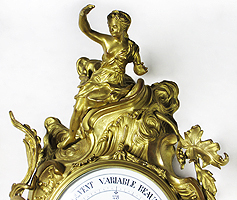 A Very Fine French 19th Century Louis XV Style Gilt-Bronze Figural Cartel Barometer by A. Crin, A Paris. 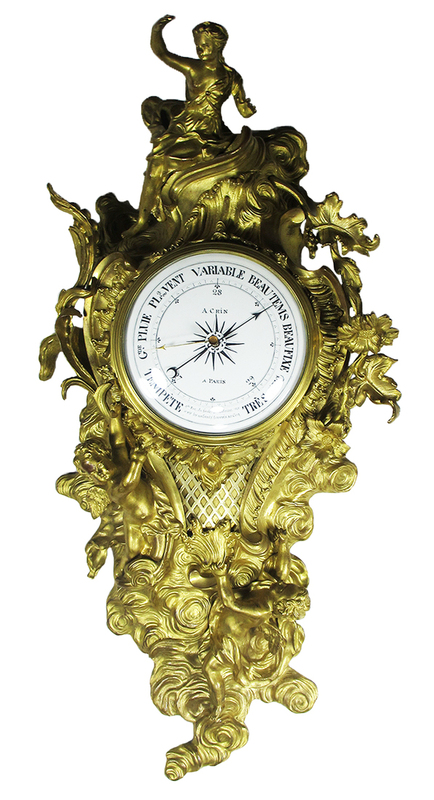 The wall mounting cartel barometer crowned with a figure of a seated maiden amongst acanthus and leaves, the circular porcelain dial with a glass cover, the face signed "A. Crin, A Paris 9 de Rue du Faubgr, St. Antoine Vis, a Vis les Anfants, Trouvés au Coq." 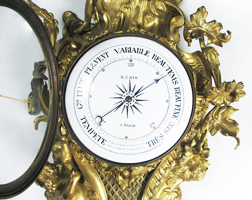 and inscribed with the different atmospheric pressure variables in French "Tempête, Cde. Pluie, Pl 2ou Vent., Variable, Beau Temps, Beaufixe Fixe and Três Sec." 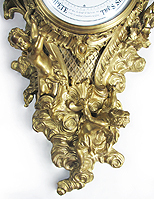 The lower part surmounted with a pair of cherubs hovering amongst the clouds and acanthus. Circa: Paris, 1870.